Kick off your visit on the 23rd (Thu): contemplate the waterfront views at Manila Bay, explore the striking landscape of Rizal Park, then admire the striking features of San Agustin Church, and finally wander the streets of Intramuros. To see where to stay, ratings, and other tourist information, refer to the Manila holiday planner. Sao Paulo, Brazil to Manila is an approximately 41-hour combination of car and flight. Due to the time zone difference, you'll lose 11 hours traveling from Sao Paulo to Manila. Traveling from Sao Paulo in February, expect a bit warmer with lows of 27°C in Manila. Cap off your sightseeing on the 23rd (Thu) early enough to travel to Coron. Visiting Barracuda Lake and Malcapuya Island will get you outdoors. 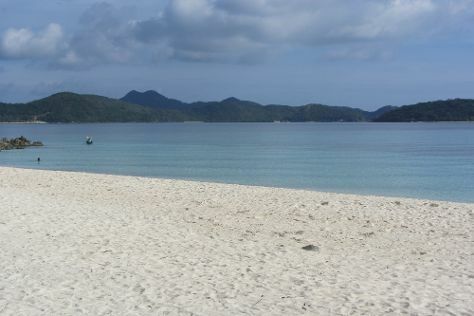 Explore hidden gems such as Twin Lagoon and Coron Bay. And it doesn't end there: contemplate the waterfront views at Kayangan Lake, stroll through Lualhati Park, head off the coast to Banana Island, and see the vivid underwater world at Coral Garden. To find other places to visit, traveler tips, where to stay, and tourist information, read our Coron itinerary builder. Traveling by combination of train, bus, flight, and taxi from Manila to Coron takes 3 hours. Alternatively, you can do a combination of ferry and taxi. You will have some time to spend on the 27th (Mon) before leaving for El Nido. Escape the urban bustle at Las Cabanas Beach and Scuba & Snorkeling. You'll discover tucked-away gems like Big Lagoon and Secret Lagoon Beach. 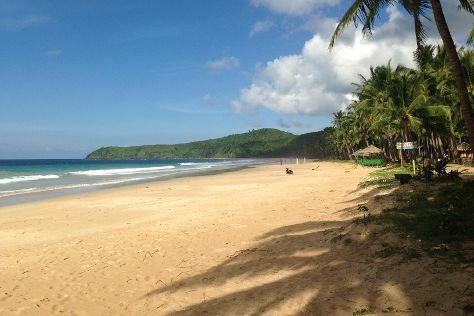 There's still lots to do: stroll through Nacpan Beach, kick back and relax at Seven Commando Beach, head off the coast to Matinloc Island, and meet some fierce fish with a shark diving experience. To find more things to do, ratings, traveler tips, and more tourist information, go to the El Nido trip itinerary planner. Getting from Coron to El Nido by combination of car, ferry, bus, and taxi takes about 23 hours. You will have some time to spend on the 5th (Sun) before leaving for Oslob. A vacation in Oslob offers a picture-perfect island paradise for those looking to escape the hustle and bustle of city life. On the 6th (Mon), head off the coast to Sumilon Island, kick back and relax at Tingko Beach, and then take your sightseeing to a higher altitude at Osmena Peak. 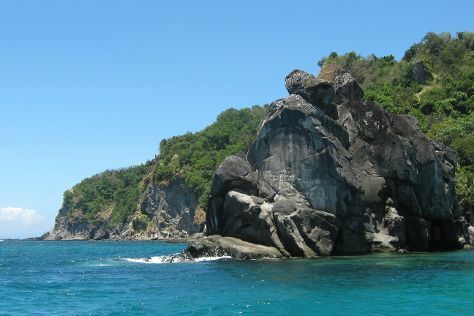 On the next day, explore the different monuments and memorials at Oslob Cemetery, take in the architecture and atmosphere at Our Lady of the Immaculate Conception Church, take in the dramatic scenery at Tumalog Falls, then get up close to creatures of the deep with a dolphin and whale watching tour, and finally scramble along the landscape with a canyoning and rapelling tour. To see maps, more things to do, other places to visit, and tourist information, read Oslob vacation builder. Getting from El Nido to Oslob by combination of taxi, bus, and flight takes about 10.5 hours. Other options: do a combination of taxi, bus, car, and ferry. Wrap up your sightseeing on the 7th (Tue) to allow time to do a combination of to Apo Island. Apo Island is a volcanic island covering 74 hectares in land area, 7 kilometers off the southeastern tip of Negros Island and 30 kilometers south of the Negros Oriental capital of Dumaguete in the Philippines. Take a break from the city and head to Apo Island Marine Reserve and Steps of a Thousand Names. To see photos, where to stay, ratings, and tourist information, you can read our Apo Island vacation planner. You can do a combination of from Oslob to Apo Island in 5.5 hours. On the 11th (Sat), you're off toMalapascua Island. Holidays on Malapascua Island rarely pass without a trip out to explore the bright blue waters that surround. Explore hidden gems such as Scuba & Snorkeling and Guimbitayan Beach. 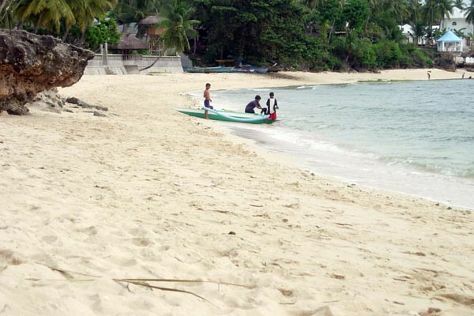 Step out of the city life by going to Kalanggaman Islet and Carnasa Island. Next up on the itinerary: meet some fierce fish with a shark diving experience, kick back and relax at Bounty Beach, steep yourself in history at Japanese Wreck Marine Sanctuary, and stroll through Logon Beach. To find where to stay, maps, photos, and other tourist information, you can read our Malapascua Island trip itinerary planner. You can do a combination of from Apo Island to Malapascua Island in 18 hours. You'll set off for Manila on the 16th (Thu). On the 16th (Thu), contemplate in the serene atmosphere at Quiapo Church, contemplate the long history of Fort Santiago, and then contemplate the geological forces at Esquieres Travel Taal Volcano Crater Tour. To see maps, where to stay, traveler tips, and other tourist information, go to the Manila vacation builder. You can do a combination of bus, taxi, flight, and train from Malapascua Island to Manila in 9 hours. Other options are to do a combination of ferry, taxi, and bus; or do a combination of ferry and taxi. Finish your sightseeing early on the 17th (Fri) so you can travel back home.